Like us, the rabbi Yeshua bar Yoseph lived in the shadows of a great and overweening empire that was held together by military might and a harsh judicial system heavily reliant on the death penalty. Although knowledgeable in the Hebrew scriptures, Yeshua often jostled with the religious authorities and was affiliated with no synagogue. The title “rabbi” was in fact an honorific bestowed on him by friends awed by his learning. Ignatieff at the November 2006 Liberal leadership convention (credit: Simon Hayter, Getty Images). On the occasion of Michael Ignatieff’s ascension to the leadership of the Liberal Party of Canada, I thought I would repost a review I wrote in 2000 of The Rights Revolution. Ignatieff and his party inevitably divide people, and my own faith in him as a leader is more tempered than it once was (I would have preferred that he assume the leadership after a contest, not before). The Rights Revolution, by contrast, is a well-written and thoughtful book that deserves to be more widely appreciated. It is surprising how little the vision of Canadian political life it offers has figured in the debate about Ignatieff the politician.–A.M. Over at the National Post, I try to assess Bush’s legacy. The full article can be read here. The wreckage that Bush has left is there for all to see, so much so that even erstwhile supporters like David Frum, who wrote some of Bush’s most memorable speeches, acknowledge that this has been a “failed presidency.” The stock market is in free fall, the largest banks and automotive companies are on the verge of bankruptcy and begging for government handouts, New Orleans is still a shadow of its old pre-Katrina glory, the nation persists in mortgaging its future to its old Cold War foe Red China, Islamic radicals continue to launch bold attacks on allies like India, violence is on the rise in Afghanistan, and Iraq (although slightly more stable than before) remains a tinderbox ready to explode. Like a lot of people watching Obama at a distance, I was a bit dismayed at how establishment his big foreign policy picks have been (Hilary Clinton and Robert Gates). But as we’re seeing more and more names, it looks like there is a method to his seeming madness (as there almost always is with Obama). He’s letting the establishment names remain as figureheads but he’s putting his own people in secondary positions at State or the United Nations (Samatha Power, Susan Rice, maybe Jim Steinberg). These are all people loyal to Obama. In effect, the establishment will continue to be the face of policy but the actual makers of policy will be Obama’s people. In some ways, Obama is doing exactly what Cheney did in late 2000 and early 2001 (when he was in charge of staffing the Bush administration): Cheney co-opted familiar big names (Colin Powell, Paul O’Neill) but he made sure that all the secondary people were neo-cons loyal to the vice-president. In sum, the strategy seems to be to let the generals keep their ribbons, as long as the lieutenants belong to the President. Happy Belated Birthday, Claude Levi-Strauss! 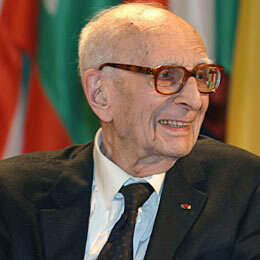 Claude Lévi-Strauss, just celebrating his centenary. This blog has been amiss in not wishing a happy birthday to Claude Lévi-Strauss, who was born on November 28, 1908. Theodore Roosevelt was in the White House when Lévi-Strauss entered this world and he’s lived to see Obama elected.